Millennials and Gen Xers account for nearly 72% of total U.S. digital banking users. Boston, August 10, 2017 – Banks and credit unions have been working hard to deliver a better customer experience for their digital channels. But financial institutions are faced with strategic questions and challenges revolving around customer engagement, or customers’ adoption and usage of as well as satisfaction with the digital banking offering. How has the adoption changed? How satisfied are consumers? 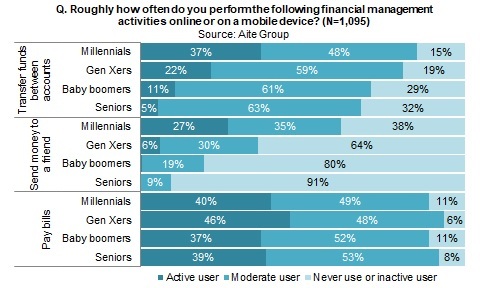 And do consumers’ usage and satisfaction levels vary by generation, type of institution, and type of digital banking user? This report seeks to better understand U.S. consumer digital banking trends in this fast-paced financial technology environment. It is based on a January 2017 Aite Group survey of 1,095 U.S. consumers who use online and/or mobile banking. This 30-page Impact Report contains 25 figures and four tables. Clients of Aite Group’s Retail Banking & Payments service can download this report, the corresponding charts, and the Executive Impact Deck.